The breeding pair may eat and drink little during the hibernation period. Provide plenty of food to the adult frogs when you place them in the breeding tank, because once they become active, they are likely to be hungry. You don't want the female to cannibalize her mate. Pacman frogs (also known as Argentine horned frogs) aren't difficult to breed in captivity. Before breeding, the pair requires a 60-day hibernation period in a dry, cool environment. Egg-laying and hatching should follow within days. Identify an adult male and female pacman frog. Males are 1 to 3 inches smaller than females and usually vocalize when handled or sprayed. Place the pair in a terrarium or tank with a substrate of sphagnum moss. Keep the temperature around 70 degrees Fahrenheit. Provide a shallow water bowl but do not spray or mist the tank. Maintain the frogs in this environment for two months. Move the frogs to a tank filled with water shallow enough that they can rest on the bottom and still breathe. Add aquatic plants where the female can attach eggs. Also provide an area out of the water that the frogs can easily access. Spray the frogs with water multiple times each day to simulate rain. 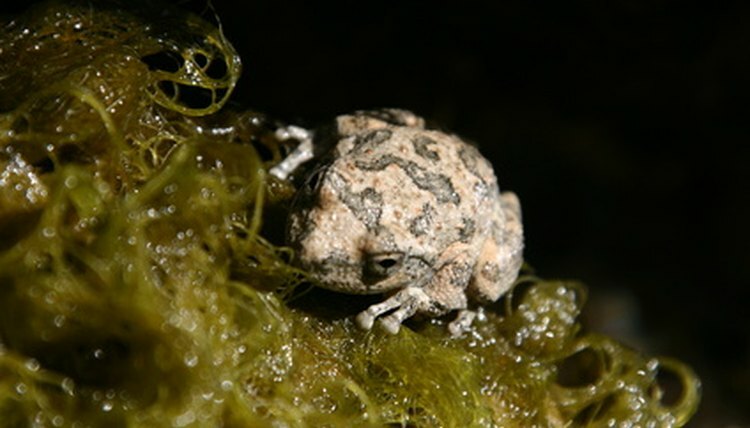 According to the article "Breeding Horned Frogs" by Ernie Wagner, featured on Melissa Kaplan's Herp Care Collection website, the female should lay eggs within four days. Return the adult frogs to their respective regular habitats, and add water to the tank with the eggs. They should hatch within three days, according to Wagner. Separate the tadpoles into individual tanks as soon as they hatch. Pacman frogs are voracious eaters and often prey on each other. Even if you provide plenty of crickets, mealworms and other food, you're likely to lose some of the tadpoles if you keep them all together.